This is Virtual Event Management. maintain focus on your presentation & let your live producer execute platform features. Get custom attendance & event analysis reporting & statistics tailored to your needs. Benefit from subject matter expertise in all top web-conference applications. As the business world continues to grow globally so does the need to connect people virtually. Organizations continue to see a dramatic rise in the need for virtual meeting applications and products to conduct internal meetings, company conferences, client demonstrations and training forums. eSkillz Virtual Event Management helps to bring end-to-end solutions to our clients resulting in more meaningful webinar events. We can support any Web-conferencing platform. eSkillz has a range of expertise across the leading web-conferencing platforms including GoToMeeting (GoToTraining & GoToWebinar) WebEx, Adobe Connect, Zoom & WebTeach. Whereby your web-conferencing platform may be new to eSkillz, we take on the research and training necessary to provide effective services and we do so with the guidance and leadership of our senior webinar Producers that possess overall strategic webinar knowhow and best practices. We have Production Support in Spanish & French. With ever changing business requirements and language options, eSkillz is continuously expanding our resources and capabilities to meet these needs. We now have language Producers available in Spanish and French! We offer "Train the Trainer" for your faculty & webinar presenters. Many of our LMS customers have indicated that their faculty/trainers are very knowledgeable in the subject matter area of the web session they are conducting but they don't know anything about the web-conferencing platform they are being asked to present within. 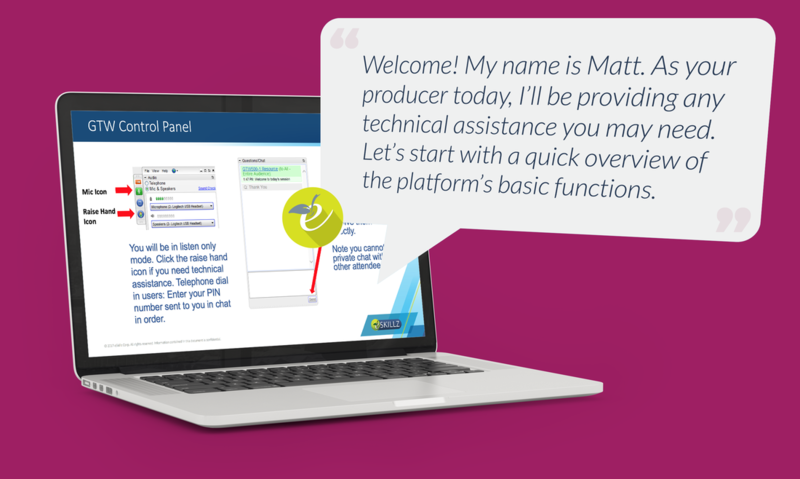 Our senior webinar Producers can train your trainers on all the bells and whistles of your designated web-conferencing platforms, conduct rehearsals and moderate for your trainers on the day of the event. Focus on your presentation and let us handle all of the conferencing details.